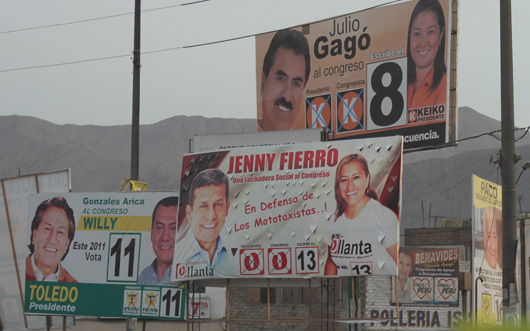 The next Peruvian presidential election will be on April 16, 2011. The economy has grown 7.2% annually over the last five years, and poverty has reduced from 51% in 2004 to 30% in 2010. However, violence has increased in recent years and a meaningful percentage of the population, mostly in highlands and rural areas, feels like it is lagging behind. The question for the electorate is: Who will keep the economy growing and improve social inclusiveness? Eleven candidates are running for president and three other parties are running congressional candidates without presidential candidates. Five of the presidential candidates capture 90% of the preference of the electorate. The ex-president Alejandro Toledo leads the polls. Luis Castaneda, ex-mayor of Lima, and Keiko Fujimori, the daughter of the ex-president Alberto Fujimori, currently compete for the second position. Ollanta Humala and Pedro Pablo Kuczynski fall behind these first three. No candidate is likely to get more than 50% of the vote in the first round, so there will be a second round to determine by majority the next president. Despite living here for 38 years, it is hard for me to grasp the rationale behind the political decisions of Peruvian electorate. Most people make their decisions in the last two weeks before the elections. I don’t know who will be the next Peruvian president, whether it will be Toledo, Fujimori, Castaneda Humala, or Kuczynski. What I can say is that the next Congress will be multi-polar, and the decisions of the next president will be intensely discussed. Photo and post by Sebastiao Ferreira. This post is number 10 of 52 in Sebastiao’s 52-week photo journal.